Howdy, neighbor! If you’ve arrived here after having read the material in the 20th Anniversary Edition (June/July 2014) of American Cowboy magazine, then know that this is the article you’re seeking. I said I’d be sharing “further reminiscences” here, and that’s exactly what’s going on. J.P.S. 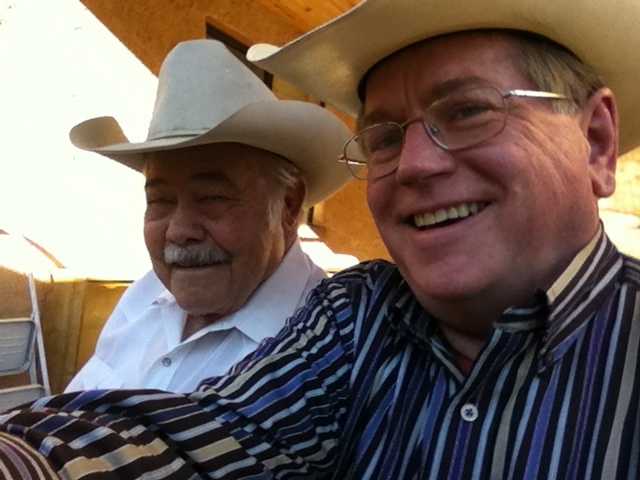 Brown (left) and myself (snapping a selfie) on the porch of Brown’s ranch house outside Patagonia, Ariz., in April 2013. I was in Tucson that month for the Tucson Book Festival and I wanted to see Joe, so I rented a car and drove the two hours down into that beautiful country. I’ll try not to repeat too much of what I said in the commentary I wrote (“Taking the Long View,” p. 68) for that issue. The essential milestones: AC was launched in 1994 in Wichita, Kan. In 1995 we took the outfit to Sheridan, Wyo. I was there in Sheridan with my family until the summer of 1999, when I had to move to Texas, for family reasons. The rest of the crew stayed in Sheridan for a few years before relocating about 35 miles down the road to Buffalo, Wyo. AC was sold to AIM Media in May 2006, whereupon AIM moved the publication to downtown Boulder, Colo. (fall 2006). I remained with the magazine until June 2009, still working from Texas. So, all told, I was with the magazine through its startup (which actually began in 1993, some months before its debut) and for its first 15 years. That’s what I’m writing about here – that decade and a half that established the direction, scope, and significance of the magazine. I know this may be a bit disjointed but that is sort of the nature of reminiscences – they tend to ramble. But I want to thank those who have been past readers of AC. It’s because of you that the magazine has accomplished what it has. While I’m at it, I’ll point you to a couple of other articles on this website that also hold some details about AC’s past. One is my own bio, which appears here. Another is this collection of brief remarks I penned in past issues. Prior to the launch of American Cowboy, our company was known as WEB Publications, Inc., and we published three magazines: Collector’s Mart, which covered limited edition figurines, plates, prints, and other such products, Art Today, which was a fine art magazine, and Antique Market Report, which was a slim periodical that followed the trading action in the nation’s auction houses, reporting on stellar sale items. I was editor of all three titles. In Collector’s Mart and Art Today, we often featured contemporary Western art, and in the early-to-middle 1990s, Western art was hot. In Antique Market Report, we often covered vintage Western art. So in each of the magazines, we were active in the field of Western art, and we were advantageously positioned to see how Western culture, and interest in the American West, was on the rise. 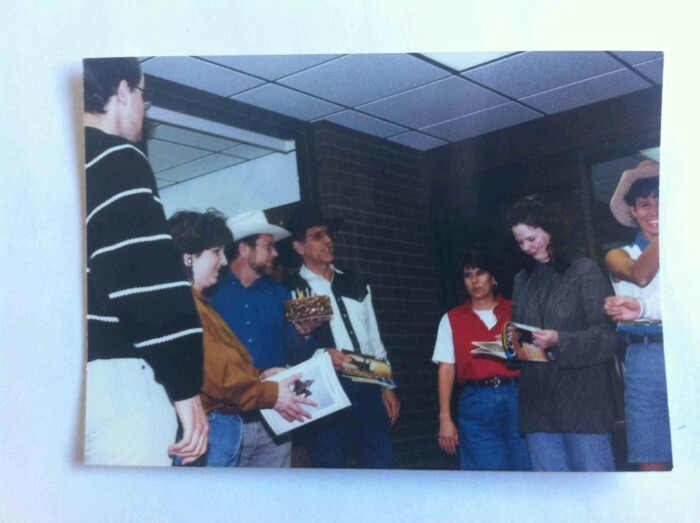 American Cowboy staffers holding the first anniversary edition of American Cowboy in 1995. From left: Scott Richards, Kim Hetzel, Jesse Mullins (holding cake for the occasion), Bill Bales, Debbie Cruz, Angela Howell, and Lori Bales.